Austin Scottish Rite Theater teams up with The Weird Sisters Women’s Theater Collective and performance artist Terry Galloway for this rollicking, cross-gender-cast period piece. 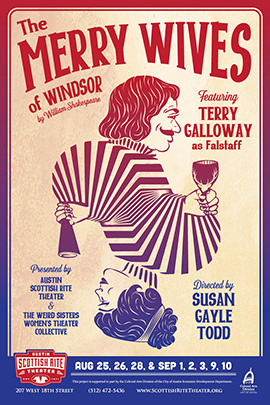 Galloway assumes the role of legendary Falstaff who visits Windsor and tries to simultaneously court two of the town’s affluent married women. This show is directed by Founding Weird Sister Susan Gayle Todd and includes past Weird Sister players Kristen Johnson, Alyson Curtis, Vicki Yoder, Melissa Johnson, Hollie Baker and more!